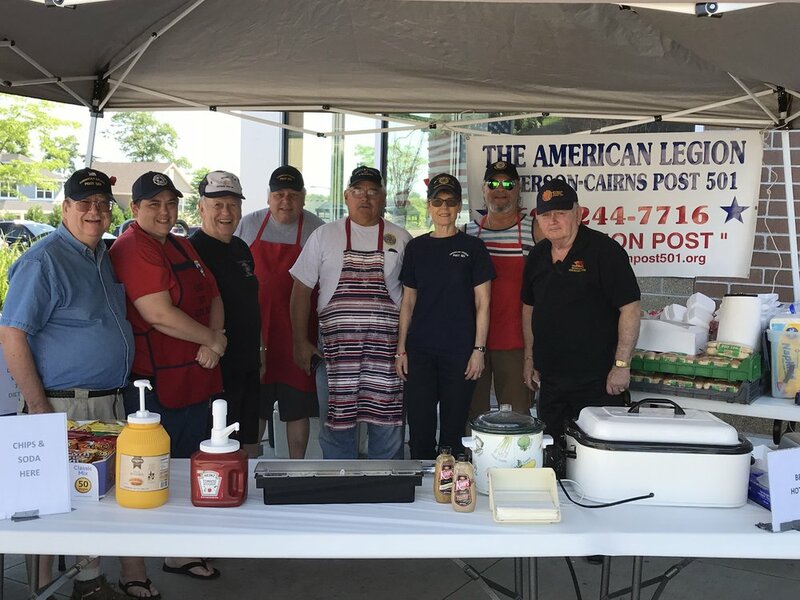 Our Post 501 volunteers helping out at the April 6, 2019 Brat Fest at Metro Market. Held on certain Saturdays, weather permitting, throughout the year. Our brat fest is scheduled for Saturday, April 20, 2019, 10:00 am - 3:00 pm at Metro Market, 6010 Cottage Grove Road, Madison, WI 53716. We are very excited to serve again at the Metro Market location. Their support for our brat fest is terrific. We have updated our supply list and should now will have sufficient brats, hot dogs, and buns. And now also we will be offering fresh made hamburgers! Next Brat Fest is May 4th at Metro Market. Let’s support Badger Honor Flight by attending the welcome home at the Dane County Regional Airport on Saturday, April 20th, at 7:15 pm, for our very own fellow Legionnaires: Paul Esser & Don Olman. Flight is scheduled to arrive by 7:15 pm. It is recommended that you get there at least and hour before that to get in place. All members of all the Dane County American Legion Posts & their Auxiliary Units are invited to attend this regional meeting. This is the best way to get updated on Legion affairs that benefit all veterans in Dane County. The latest news from higher headquarters is often passed down. Put this on your calendar and let your voice be heard. Next scheduled Post 501 Executive Committee Meeting is May 25. RSVP to Keith Lovell at (608)445-2096 between now and April meeting. American Legion Post and Auxiliary Unit 501 have an opportunity to pickup extra funds to continue our support to Veteran's programs. We will be doing a Meat Raffle at Tully's II Food & Spirits, 6401 Monona Drive, Monona, WI, on April 27th, 3:00-5:00 p.m.
Next event to be held May 11, 2019. Held on certain Saturdays, weather permitting, throughout the year. Our brat fest is scheduled for Saturday, May 4, 2019, 10:00 am - 3:00 pm at Metro Market, 6010 Cottage Grove Road, Madison, WI 53716. We are very excited to serve again at the Metro Market location. Their support for our brat fest is terrific. We have updated our supply list and should now will have sufficient brats, hot dogs, and buns. And now also we will be offering fresh made hamburgers! Next Brat Fest is Sunday, May 19 at Metro Market. Post 501 is hosting the 2019 Annual WI American Legion Convention. This meeting is essential in making the plans to ensure that the convention goes off without a hitch. All members of Post 501 to include the Auxiliary and Sons of American Legion are needed and welcome to attend this planning meeting. This is a major project for the members of Post 501 for the upcoming year. Please attend and provide your input. We will need volunteers for various projects. The Middleton Senior Center will be hosting their first Quilt of Valor presentation on Wednesday, May 8th at 8:00 a.m. at the Middleton Senior Center, 7448 Hubbard Avenue, Middleton, WI. Post 501’s Legionnaires, Don & Sherry Schaefer, along with other Veterans, will be presented a quilt made by the Quilt of Valor Foundation. The quilts are tokens of appreciation that say, “Thank You for your service, sacrifice, and valor”. Post 501 members are invited in support of Don & Sherry. Please contact Post 501’s Cdr Tom at 608-244-7716 to let him know if you will be attending. 8:00 a.m. - Catered breakfast at the Senior Center for all Veterans, Spouses, Friends, and Family. student from the Middleton High School. 9:00 a.m. - Quilt Awards by the Sugar River Chapter of the Quilts of Valor. This is the most important Post 501 meeting of the year because it's the evening we elect new officers to lead this post. Be sure to attend or your name may be submitted for nomination for an officer's position in your absence. All paid-up members are reminded that they will need to have their current American Legion card to be eligible to vote. Next meeting scheduled: Wednesday, June 12th, which include the installation of new Post Officer leaders. Refer to the Severson-Cairns Post 501 May, 2019, Newsletter for the Auxiliary Presidents message. Please see the Newsletter tab above for further information. American Legion Post and Auxiliary Unit 501 have an opportunity to pickup extra funds to continue our support to Veteran's programs. We will be doing a Meat Raffle at Tully's II Food & Spirits, 6401 Monona Drive, Monona, WI, on May 11th, 3:00-5:00 p.m.
Next event to be held May 25, 2019. Department Commander, Frank Kostka, cordially invites you to join him for his testimonial on May 11, 2019. There will be a buffet dinner, and a D.J. for all to enjoy. The cost is $30.00/person. Please click on the link below for the invitation. Our Legion Post 501 Coffee, Cards, Donuts & Camaraderie is working well. This gathering doesn't involve business talk, nor work at the post, nor fund raising. We invite all veterans and their spouses are welcome to stop in sometime between 9 am till Noon, on Thursday, May 16th, for some coffee, some conversation, possibly a card game or two, and for those who come hungry - maybe some donuts, kringle or what have you. Held on certain Saturdays, weather permitting, throughout the year. Our brat fest is scheduled for Sunday, May 19, 2019, 10:00 am - 3:00 pm at Metro Market, 6010 Cottage Grove Road, Madison, WI 53716. We are very excited to serve again at the Metro Market location. Their support for our brat fest is terrific. We have updated our supply list and should now will have sufficient brats, hot dogs, and buns. And now also we will be offering fresh made hamburgers! Next Brat Fest is Sunday, May 26, at Metro Market. Next House Committee Meeting is July 27. Next scheduled Post 501 Executive Committee Meeting is June 28. American Legion Post and Auxiliary Unit 501 have an opportunity to pickup extra funds to continue our support to Veteran's programs. We will be doing a Meat Raffle at Tully's II Food & Spirits, 6401 Monona Drive, Monona, WI, on May 25th, 3:00-5:00 p.m.
Next event to be held TBD..
Services at Forest Hill Cemetery in Madison begin at 8 a.m. Assemble at Soldier's Rest with the service by the Madison Veterans Council at 8:10 a.m. Each year Post/Unit 501 carry flags at the service at Forest Hill Cemetary. If you are interested in helping out or want more info., please contact Unit 501 President, Rebecca Lovell, at 608-513-2725. State Capitol Memorial Day events begin at 9:30 a.m. with a VFW Post 1318 band concert. The memorial service with guest speakers Gov. Jim Doyle and Veterans Affairs Secretary Ken Black is at 10 a.m. Events will take place at the State Street entrance to the state Capitol. The rain location will be the first floor rotunda. Parades are always fun. Why not come to this annual Memorial Day Parade on Monday, May 27th starting about 10:00 a.m.
Monona Memorial Day Parade begins at 10 a.m. with a 1.5 mile parade route starting just past Monona Grove High School, at 4400 Monona Drive and traveling south on Monona Drive to Pflaum Road, disbanding at Sennett Middle School. For details and if you would like to participate by riding in the automobile with Post 501, please call Post 501 at 244-7716. Held on certain Saturdays, weather permitting, throughout the year. Our brat fest is scheduled for Saturday, June 1, 2019, 10:00 am - 3:00 pm at Metro Market, 6010 Cottage Grove Road, Madison, WI 53716. We are very excited to serve again at the Metro Market location. Their support for our brat fest is terrific. We have updated our supply list and should now will have sufficient brats, hot dogs, and buns. And now also we will be offering fresh made hamburgers! Next Brat Fest is Friday & Saturday June 14-15 at Post 501, 105 Dempsey Road.. Refer to the Severson-Cairns Post 501 June, 2019, Newsletter for the Auxiliary Presidents message. Please see the Newsletter tab above for further information. Held on certain Saturdays, weather permitting, throughout the year. Our brat fest/ garage sale is scheduled for Friday, June 14, 10:00 am - 6:00 pm at Post 501, 105 Dempsey Road, Madison, WI 53714. Next Brat Fest scheduled for June 15 at Post 501. Held on certain Saturdays, weather permitting, throughout the year. Our brat fest/ garage sale is scheduled for Saturday, June 15, 10:00 am - 6:00 pm at Post 501, 105 Dempsey Road, Madison, WI 53714. Next Brat Fest scheduled for July 6 at Metro Market. Our Legion Post 501 Coffee, Cards, Donuts & Camaraderie is working well. This gathering doesn't involve business talk, nor work at the post, nor fund raising. We invite all veterans and their spouses are welcome to stop in sometime between 9 am till Noon, on Thursday, June 20th, for some coffee, some conversation, possibly a card game or two, and for those who come hungry - maybe some donuts, kringle or what have you. Our 2nd Annual 40 et 8 brat fest is scheduled for Sunday, June 23, 2019, 10:00 am - 3:00 pm at Metro Market, 6010 Cottage Grove Road, Madison, WI 53716. This fund raiser is being held in support of our nurses training for the Honor Society of the American Veterans (40 et 8). Tables are available on the Metro Market patio, so you can sit and enjoy a fresh off the grill brat, hamburger, and/or hot dog. We offer Johnsonville brats, hamburgers, and hot dogs. All come with or without buns, condiments, and full meals come with soda or water, and a wide selection of salted chips. Want to have some fun socializing with fellow Voyageurs? Then join us in the serving line or for setup, or cleanup at the end. If you can provide an hour or two of your time on a Saturday morning, we’d really appreciate your helping out. We do need the additional support due to the popularity of this brat fest location. Next scheduled Post 501 Executive Committee Meeting is July 27. Held on certain Saturdays, weather permitting, throughout the year. Our brat fest is scheduled for Saturday, July 6, 2019, 10:00 am - 3:00 pm at Metro Market, 6010 Cottage Grove Road, Madison, WI 53716. We are very excited to serve again at the Metro Market location. Their support for our brat fest is terrific. We have updated our supply list and should now will have sufficient brats, hot dogs, and buns. And now also we will be offering fresh made hamburgers! Next Brat Fest is Saturday, August 3 at Metro Market. Military Appreciation Day at Warner Park. Special Ticket pricing available. Contact Post 501 at 608-244-7716 for tickets. Next meeting scheduled: Wednesday, August 14, 2019. Be sure to set these dates on your calendar for this all important annual event. As in the past this is a terrific time for fellow Legionnaires and the Auxiliary and SAL members, Legion Riders to gather to make plans for the next year in continuing our service to Veterans. Your presence is truly needed at this convention. Further details will be provided as soon as guidance comes out. There will be numerous programs available which will increase your ability to be a more effective Legionnaire. There will be speakers, vendor tables, and raffles for your benefit. Come and share the fellowship. Our Legion Post 501 Coffee, Cards, Donuts & Camaraderie is working well. This gathering doesn't involve business talk, nor work at the post, nor fund raising. We invite all veterans and their spouses are welcome to stop in sometime between 9 am till Noon, on Thursday, July 25th, for some coffee, some conversation, possibly a card game or two, and for those who come hungry - maybe some donuts, kringle or what have you. Next House Committee Meeting is TBD. Next scheduled Post 501 Executive Committee Meeting is August 30th. Held on certain Saturdays, weather permitting, throughout the year. Our brat fest is scheduled for Saturday, August 3, 2019, 10:00 am - 3:00 pm at Metro Market, 6010 Cottage Grove Road, Madison, WI 53716. We are very excited to serve again at the Metro Market location. Their support for our brat fest is terrific. We have updated our supply list and should now will have sufficient brats, hot dogs, and buns. And now also we will be offering fresh made hamburgers! Next Brat Fest is Friday & Saturday, August 16-17 at Post 501. Next meeting scheduled: Wednesday, September 11. Held on certain Saturdays, weather permitting, throughout the year. Our brat fest/ garage sale is scheduled for Friday, August 16, 10:00 am - 3:00 pm at Post 501, 105 Dempsey Road, Madison, WI 53714. Next Brat Fest scheduled for August 17 at Post 501. Held on certain Saturdays, weather permitting, throughout the year. Our brat fest/ garage sale is scheduled for Saturday, August 17, 10:00 am - 3:00 pm at Post 501, 105 Dempsey Road, Madison, WI 53714. Next Brat Fest is Sep. 7 (TBD). Our Legion Post 501 Coffee, Cards, Donuts & Camaraderie is working well. This gathering doesn't involve business talk, nor work at the post, nor fund raising. We invite all veterans and their spouses are welcome to stop in sometime between 9 am till Noon, on Thursday, August 22nd, for some coffee, some conversation, possibly a card game or two, and for those who come hungry - maybe some donuts, kringle or what have you. The 40 et 8 brat fest is scheduled for Saturday, August 31, 2019, 10:00 am - 3:00 pm at Metro Market, 6010 Cottage Grove Road, Madison, WI 53716. This fund raiser is being held in support of our nurses training for the Honor Society of the American Veterans (40 et 8). Refer to the Severson-Cairns Post 501 September, 2019, Newsletter for the Auxiliary Presidents message. Please see the Newsletter tab above for further information. 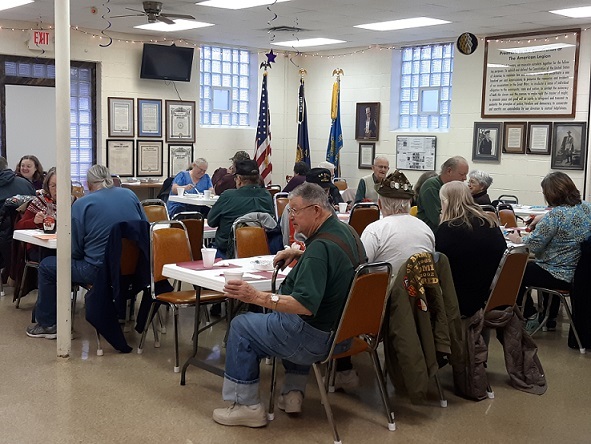 Our Legion Post 501 Coffee, Cards, Donuts & Camaraderie is working well. This gathering doesn't involve business talk, nor work at the post, nor fund raising. We invite all veterans and their spouses are welcome to stop in sometime between 9 am till Noon, on Thursday, September 19th, for some coffee, some conversation, possibly a card game or two, and for those who come hungry - maybe some donuts, kringle or what have you. Next meeting scheduled: Wednesday, November 13. Refer to the Severson-Cairns Post 501 October, 2019, Newsletter for the Auxiliary Presidents message. Please see the Newsletter tab above for further information. Our Legion Post 501 Coffee, Cards, Donuts & Camaraderie is working well. This gathering doesn't involve business talk, nor work at the post, nor fund raising. We invite all veterans and their spouses are welcome to stop in sometime between 9 am till Noon, on Thursday, October 17th, for some coffee, some conversation, possibly a card game or two, and for those who come hungry - maybe some donuts, kringle or what have you. Next meeting scheduled: Wednesday, December 11. Refer to the Severson-Cairns Post 501 November, 2019, Newsletter for the Auxiliary Presidents message. Please see the Newsletter tab above for further information. There will be a welcoming program, and some shared ideas of programs for the Post 501 SAL members in the next 2019 year. Maybe a Fall Saturday afternoon football/cribbage/euchre gathering in the clubhouse, with free snacks and libations. Plan on attending. Our meetings are open to any Legionnaire past or present, who have an interest in just what goes on in "post active" and "reserve service". Come and see veterans who, like yourself have marched, floated or flown on active duty for at least one day or more, during times of conflict. Served in or near combat zones, in support activities or have a book of questions that need to be answered. We want to hear about you, the part you played....... all the details from those who were really there. Hidden and amazing. Come, raise a toast to our country and the part you and others played to keep it free and safe! As you know FREEDOM is not free. It costs dearly! SAL members are also always invited in attendance. Your presence is especially desired. Next meeting scheduled: Wednesday, January 8, 2020. Refer to the Severson-Cairns Post 501 December, 2019, Newsletter for the Auxiliary Presidents message. Please see the Newsletter tab above for further information. 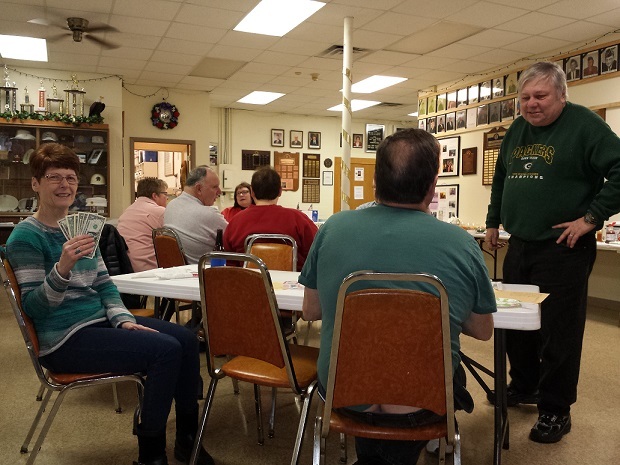 Our Legion Post 501 Coffee, Cards, Donuts & Camaraderie is working well. This gathering doesn't involve business talk, nor work at the post, nor fund raising. We invite all veterans and their spouses are welcome to stop in sometime between 9 am till Noon, on Thursday, December 19th, for some coffee, some conversation, possibly a card game or two, and for those who come hungry - maybe some donuts, kringle or what have you. Our Legion Post 501 Coffee, Cards, Donuts & Camaraderie is working well. This gathering doesn't involve business talk, nor work at the post, nor fund raising. We invite all veterans and their spouses are welcome to stop in sometime between 9 am till Noon, on Thursday, April 18th, for some coffee, some conversation, possibly a card game or two, and for those who come hungry - maybe some donuts, kringle or what have you. Participants at Post 501’s March 9th breakfast. Next meeting scheduled: Wednesday, May 8. Refer to the Severson-Cairns Post 501 April, 2019, Newsletter for the Auxiliary Presidents message. Please see the Newsletter tab above for further information. Held on certain Saturdays, weather permitting, throughout the year. Our brat fest is scheduled for Saturday, April 6, 2019, 10:00 am - 3:00 pm at Metro Market, 6010 Cottage Grove Road, Madison, WI 53716. We are very excited to serve again at the Metro Market location. Their support for our brat fest is terrific. We have updated our supply list and should now will have sufficient brats, hot dogs, and buns. And now also we will be offering fresh made hamburgers! Next Brat Fest is April 20th at Metro Market. American Legion Post and Auxiliary Unit 501 have an opportunity to pickup extra funds to continue our support to Veteran's programs. We will be doing a Meat Raffle at Tully's II Food & Spirits, 6401 Monona Drive, Monona, WI, on March 30th, 3:00-5:00 p.m.
Next event to be held April 13, 2019. Post 501 is hosting the 2019 Annual WI American Legion Convention. This meeting is essential in making the plans to ensure that the convention goes off without a hitch. All members of Post 501 to include the Auxiliary and Sons of American Legion are needed and welcome to attend this planning meeting. This is a major project for the members of Post 501 for the upcoming year. Please attend and provide your input. We will need volunteers for various projects to include golf cart drivers. Note: This is the deadline for our pin design. Please come prepared to discuss pin designs. Menu: Chicken Breast, Ham, Mashed Potatoes w/Gravy, Green Beans, Corn, Salad, Roll, Beverage and Birthday Cake. Be sure to read the March newsletter for further details. It's not too late to make your reservation. If interested, see the Post 501 Commander, or any Post 501 member, or call 608-244-7716. You can also Let us know by clicking on the CONTACT US tab and filling in the details of who will be attending. A sign-up sheet is also at the Post 501 clubhouse. The dinner cost will be $12.50 per person or $25 per couple. Please RSVP and pay by March 15th. Make check payable to “Post 501” and mail to: American Legion Post 501, P.O. Box 14255, Madison, WI 53708-0255; or call the Post at 244-7716. Thank you for your support of Post 501. Next scheduled Post 501 Executive Committee Meeting is April 26. Next House Committee Meeting is April 26. Our Legion Post 501 Coffee, Cards, Donuts & Camaraderie is working well. This gathering doesn't involve business talk, nor work at the post, nor fund raising. We invite all veterans and their spouses are welcome to stop in sometime between 9 am till Noon, on Thursday, March 21st, for some coffee, some conversation, possibly a card game or two, and for those who come hungry - maybe some donuts, kringle or what have you. American Legion Post and Auxiliary Unit 501 have an opportunity to pickup extra funds to continue our support to Veteran's programs. We will be doing a Meat Raffle at Tully's II Food & Spirits, 6401 Monona Drive, Monona, WI, on March 16th, 3:00-5:00 p.m.
Next event to be held March 30, 2019. Refer to the Severson-Cairns Post 501 March, 2019, Newsletter for the Auxiliary Presidents message. Please see the Newsletter tab above for further information. Next meeting scheduled: Wednesday, April 10. Colleen enjoying Post 501's corned beef dinner, 3/11/2017. Be sure to save this event on your calendar. Public Welcome. Again, if you don't arrive early (we start serving at 4:00 pm till out), Chef Rishard's creative cuisine most likely will run out before 7:00 pm, in celebration of St. Patrick's Day when we can all be Irish for a moment. The cost is $10.00 for adults and $4.00 for children 10 and under. There will be generous portions of savory corned beef, succulent cabbage, potatoes and carrots, dessert. A full house for breakfast. American Legion Post and Auxiliary Unit 501 have an opportunity to pickup extra funds to continue our support to Veteran's programs. We will be doing a Meat Raffle at Tully's II Food & Spirits, 6401 Monona Drive, Monona, WI, on March 2nd, 3:00-5:00 p.m.
Next event to be held March 16, 2019. ATTENTION: DUE TO THE FORECASTING ON THE WEATHER FOR SATURDAY, THE SPAGHETTI DINNER HAS BEEN CanCELLED !! The dinner just may be rescheduled for a later date. Stay close to the monthly calendar in your Post 501 Website for further guidance. Next scheduled Post 501 Executive Committee Meeting is March 23. Our Legion Post 501 Coffee, Cards, Donuts & Camaraderie is working well. We had seven Legion members show up at the last meeting. We talked about all those who didn’t show. Be alert! This gathering doesn't involve business talk, nor work at the post, nor fund raising. We invite all veterans and their spouses are welcome to stop in sometime between 9 am till Noon, on Thursday, February 21st, for some coffee, some conversation, possibly a card game or two, and for those who come hungry - maybe some donuts, kringle or what have you. American Legion Post and Auxiliary Unit 501 have an opportunity to pickup extra funds to continue our support to Veteran's programs. We will be doing a Meat Raffle at Tully's II Food & Spirits, 6401 Monona Drive, Monona, WI, on February 16th, 3:00-5:00 p.m.
Next event to be held March 2, 2019. Refer to the Severson-Cairns Post 501 February, 2019, Newsletter for the Auxiliary Presidents message. Please see the Newsletter tab above for further information. This is an especially important meeting, due to the fact that we will be voting on "LEGIONNAIRE of the YEAR", and every vote counts. (Only active Members can vote.) This meeting will also nominate and vote on an unsung hero of Post 501, a person who is not a legionnaire, but who stands steadfast in support of our important mission of standing up for the veteran and their families. If you can only come to one membership meeting per year, please make this one. You will be free to nominate anyone you wish - one whom you feel has gone above and beyond the normal expectations. We've got many deserving Legionnaires supporting this post, either through hours served and/or dollars donated. This is a top honor, second only to being voted Post Commander. Come and be counted, the voting is secret. Next meeting scheduled: Wednesday, March 13, 2019. 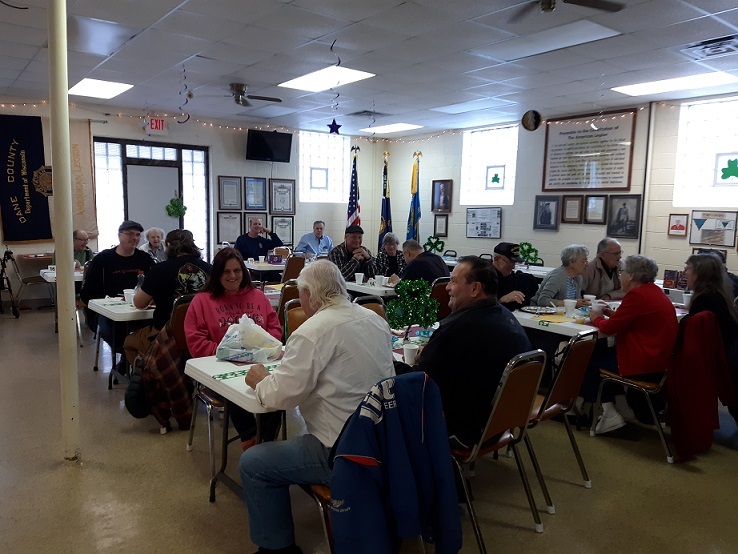 Folks enjoying Post 501’s breakfast on Jan. 12th. Followup to the 2018 Super Bowl Post 501 Party Time. We had a fun time again for our 2nd celebration of the Super Bowl extravaganza. In 2018 we had 16 friendly folks share good times, sampled tail gate rations, watched the multi million dollar advertisements, played cribbage, talked about those who didn't show up, and some of us even watched the game itself. Without our Packers in the game, following the scoring may not be as much of an interest, but the opportunity to network with veterans such as yourself will be enhanced. Based on the turnout this year, we're quite sure that the Post 501 Super Bowl Party for 2019 will kick off as scheduled. Put February 3, 2019, on your calendar for a fun time at the Legion Post 501 clubhouse in celebration of the Super Bowl . Share an afternoon with all fellow veterans. Active Duty, Guard, and Reserve service persons, and their families, are all welcome. We'll start at about 4:00 pm; Kickoff time 5:30 pm. We'll stay until the game ends. We'll have card games, checkers, chess, and a score sheet for some of the better new advertisements trying to entice us to buy stuff. There will be copious quantities of liquid libations, to include soda - a donation for these will be appreciated. In addition, we will have tailgate type snacks aplenty (although don't plan on a full meal type operation). So don't spend the afternoon alone, bring a friend or spouse and join in the merriment. Post Super Bowl LIII, (53) we had 43 folks show up. Excellent selection of tailgate type foods, and lots of laughs and good conversations happened. If you missed this one, plan on next year showing up, by doing so, no one will talk about you in your absence. :). By the way, we were able to sign a new member to our post at this get togethr. Congratulations ! Post 501 is certainly an action post ! Plan on arriving around 4 PM, and stay as long as you like. We will remain open until the game ends. We already have the team to set up and take down, an amateur bartender will be on site (do not harass - he is working for free), so no work is required on your part. For those who were unable to attend last year's Super Bowl party day, you did miss a fun time. You just might want to stay only long enough time to grab a bite to eat and say "Hi". All are welcome. Come regardless of the weather. If the snow reaches 4 feet or more, we will send a snowmobile over for you. Don't spend the Super Bowl day alone; our Post 501 will be a lot less expensive than the local taverns and even better - filled with folks just like you. It's a fun day at your Legion. For headcount, please send send a note utilizing the "Contact Us" tab on our website if you just might show up. Those who don't will most certainly be talked about. :) See you all there !